Building congregational vitality by challenging congregations and their members to deepen and energize their faith and grow as joyful leaders and disciples, actively engaged with their community as they share the gospel of Jesus Christ in word and deed. Dismantling structural racism by fearlessly applying our faith to advocate and break down the systems, practices and thinking that underlie discrimination, bias, prejudice and oppression of people of color. Eradicating systemic poverty by acting on our beliefs and working to change laws, policies, plans and structures in our society that perpetuate economic exploitation of people who are poor. Accepting the invitation is easy. The first step is to visit the website pcusa.org/matthew25 to sign up. Then, as churches and mid councils live out their commitment, they’re asked to share the impact the pledge has made: how their congregation has changed and discovered new passions and vitality — and how members have been re-energized as disciples. The goal of the national church is to be a clearinghouse of resources, training materials, devotional and preaching aids, success stories, curricula and more. Last month, the Rev. Dr. Diane Moffett, president and executive director of the Presbyterian Mission Agency, spoke to national church staff in the Presbyterian Center Chapel about the invitation. According to Moffett, what we learn by reading Matthew 25 — especially verses 31-46, the Judgment of the Nations — is that it’s not just what we say, but more importantly what we do, that matters to God. 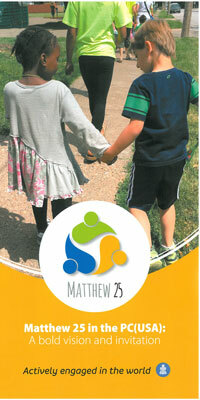 Churches and mid councils that accept the Matthew 25 Invitation will receive resources to help them get started. Speaking on the congregational vitality focus, Moffett said the important measure won’t be the size of a church’s budget or its membership roll, but the impact the church has in the community. “We can judge vitality by how many people will miss the congregation if it is no longer there,” she said. Here, Jesus is concerned about people who are hungry and thirsty, who are strangers, naked, sick or in prison. Moffett said the difference between the sheep and goats is that the sheep are regenerated after their encounter with Jesus’ sacred presence.